The newest up and coming Jewish music artist joins with legend Avraham Fried in this new clip. 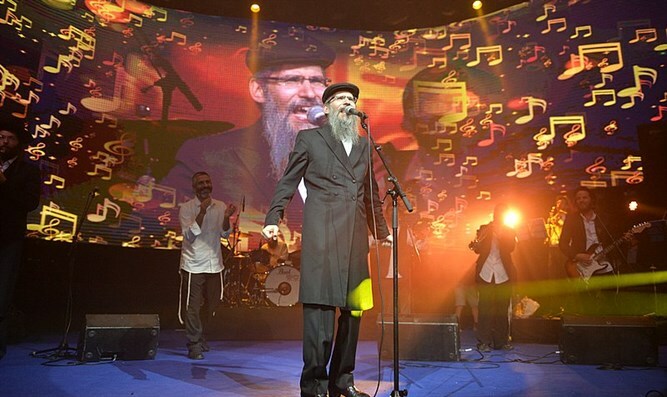 Singer and composer Meilech Kohn, who has been described as one of the major discoveries of last year in the Hasidic music with his album, "Yeder Einer" and big hit, "VeUhavtu” reached another pinnacle on Wednesday when for the first time he held a joint performance with the Hasidic singer Avraham Fried at the annual “Sulam” concert. Kohn was complimented and invited on to the stage by Fried. "I’d like to invite to the stage a man who has taken the world by storm," Fried announced in his singing voice. The concert, moderated by Menachem Toker and held for the third consecutive year, attracts hundreds of Chareidi businessmen from the United States and Europe who choose to celebrate the Sukkot holiday with their families in Jerusalem. The Sulam concerts, conducted by the producers of Fleishman Peles Productions, have included in past years the likes of other Hasidic singers such as Mordechai Ben David, Benny Friedman, and Ohad Moskowitz. All of the proceeds from the ticket sales will go to the Sulam organization, which is headed by Rebbetzin Esther Ernster and assists hundreds of children with special needs towards rehabilitation as well as integration into regular educational systems.